Auction contains over 50 back bar bottles, over 70 pieces of gold quartz, over 140 Native American & Western lots, over 50 Bowie knives and other gold rush items! Reservations need to be made by 12/19/16 to receive discount. 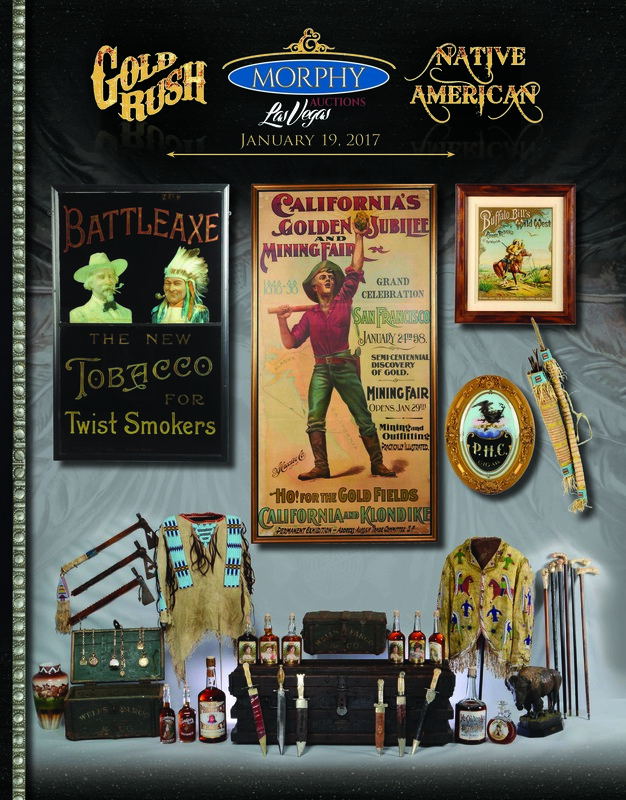 Morphy Auctions’ Upcoming January, 2017 Gold Rush and Native American Sales Event to Feature An Important Collection of Museum-Quality Indian and Western Materials, Hand Weapons, Gold Quartz Jewelry, Currencies, and Early Back Bar Bottles. This highly anticipated auction presents almost 600 lots that reflect the history and happenings of the United States during the 19th and early 20th centuries. Morphy Auctions, the finest auction destination for fresh to the market collections, is pleased to announce this can’t miss sale to be held on Thursday, January 19th at the company’s Las Vegas, Nevada gallery starting at noon EST. This event will feature “the best of the west” across numerous collecting categories and price points. All items in this sale are available for preview now. This sale’s selection of over 50 American and English Bowie knives is truly on the cutting edge. Bowie knives are fixed blade fighting knives with a cross-guard and a clip point; they are named after James Bowie who was known for his knife fighting skills. Bowie died at the Alamo. Getting right to the point, lot #226, a Rezin Bowie Presentation Knife, is the big prize in this key category. This example was one of four knives given by Rezin Bowie, brother of James Bowie, to four important friends in honor of James’ accomplishments. This knife was gifted to Edwin Forrest, a popular American actor who was friend to both Bowie brothers. This well documented rarity with provenance is estimated at $100,000-200,000 and should be of great interest to historians, museums, and miliatria enthusiasts worldwide. Other rock-star caliber Bowie knives include lot #55, a c. 1835 knife stamped Schively 75 Chestnut Street Philad., estimated at $75,000-125,000. This breathtaking example, complete with its beautiful, classic skeletal style Schively scabbard with German silver mounts, is one of less than two dozen known in existence. And lot #56, a massive c. 1835 knife stamped Broomhead & Thomas Celebrated American Hunting Knife, is estimated at $45,000-60,000. This rarity, in wonderful condition, is detailed with German silver mounts, Mother of Pearl scales, four decorative rivets, and a nameplate on both sides. It also comes with its original brown leather scabbard. This event offers a 24 carat opportunity to purchase some of the finest antique gold bars, nuggets, gold quartz jewelry, watches, and accessories in memory. Collectors will undoubtedly take a shine to the more than 60 precious metal selections on offer. Bar none, lot #106, a Harris Marchand & Co. gold bar with serial number 6476, is the prime investment in this auction with its $250,000-350,000 estimate. This large, all original and documented rectangular ingot weighs 56.65 ounces and has an 1857 value of $1002.42. Lot #104, a spectacular and highly ornate pocket watch, is another timely auction highlight. This solid gold timepiece, estimated at $50,000-80,000, is made and signed by the Illinois Watch Company and features elaborate gold in quartz and moss agate decorations, elegant engraving, and a highly desirable watch chain. And lot #114, a rare gold match safe inlaid with gold quartz on both sides as well as its top, should spark lots of interest with its $15,000-25,000 estimate. Native American cultural materials and weapons are two key categories in this exciting, upcoming sale. Many of these one of a kind treasures and artifacts exhibit extraordinary craftsmanship. Lot #169, a c. 1870 Cheyenne beaded war shirt is made from buffalo hide and features hair drops. It is estimated at $30,000-60,000. Lot #4, a beautiful c. 1860 Northern Plains contour pipe bag detailed with an unusual pony beaded panel with a stylized butterfly, copper cones, and brass beads, is estimated at $15,000-25,000. And lot #10, a c. 1860’s early Sioux beaded buffalo hide cradle decorated with horse tracks is estimated at $20,000-40,000. It’s time to get a handle on this event’s selection of interesting and antique tomahawks. Lot #179, a c. 1760 Eastern pipe tomahawk, features an iron head with a scalloped edge and brass inlay, a blade engraved with a cannon on one side and the sun on the reverse, and a brass inlaid pipe bowl. It retains its original gasket and haft and is estimated at $50,000-100,000. Lot #346, a c. 1870 Cheyenne Plains tomahawk with an extremely wide pictorial blade depicting two Indians in battle is estimated at $30,000-40,000. And lot #13, a c. 1870 Plains pipe tomahawk is unusually decorated with two bat wing cut-outs, seven inlaid brass circles, and design elements punched around the blade. This stunning, rare example is estimated at $30,000-40,000. Antique materials relating to America’s expansion in the 1800’s is well represented in this sale. Many “Go West” themed items are on offer, including signs, posters, calendars, displays, and other ephemeral categories. lot #316, a Rock Island railroad reverse glass advertising sign has Mother of Pearl inlays along the entire locomotive and shows incredible detail. This sign would have hung in an executive’s office and was made by the Western Sandblasting Co. in Chicago. It is estimated at $40,000-80,000. Could there be a bidding war over lot #146, a Battle Axe cigar reverse glass advertising sign? This remarkable example shows an image of a smiling Native American and an older well-dressed gentleman enjoying some Battle Axe tobacco; the colors are magnificent and this piece has a great presence. It is estimated at $80,000-150,000. And it’s “California, here I come!” with lot #313, an advertisement from 1898 for “California’s Golden Jubilee and Mining Fair.” This jewel of a piece pictures a miner with axe slung over his shoulder and raising a large gold nugget above his head. It has an auction estimate of $40,000-80,000. This sale rounds out with an intoxicating blend of outstanding vintage and antique back bar bottles, with over 50 examples on offer. Lot #258, a c. 1890 fine old gin label under glass bottle featuring an attractive young woman wearing a large hat, flirts with a $15,000-25,000 estimate. Lot #87, a c. 1895 Custer’s Reserve whiskey back bar bottle decorated with enameled lettering and a fantastic image of Custer riding a horse, takes a stand at $10,000-15,000. And lot #415, a c. 1895 a Black Cat Whiskey enameled bar bottle in excellent plus condition will have collectors “feline groovy” with its $4,000-6,000 estimate. Our Las Vegas gallery is open Monday through Friday from 9:00am-4:00pm.